It seems that the first Chinese student to graduate from the University of Pennsylvania was Moon Hung Chaun, who earned a Doctorate of Dental Surgery in 1899. Henry Kunghui Chang earned a Bachelor of Laws degree at Penn in 1909, a year in which four other Chinese students graduated. In fact, it seems that most of the Chinese graduates from the University of Pennsylvania were either earning Bachelor’s degrees in economics, Medical degrees, or Law degrees through 1911. 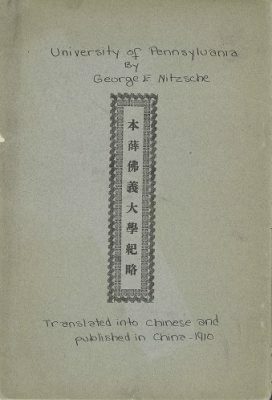 In 1910 George Nitzsche published what was essentially a course catalogue in both Chinese (cover page pictured below) and Spanish, and it was discovered that Penn alumni living in Shanghai had established a University of Pennsylvania Club there as early as 1915, with the former Chinese Ambassador, Wu Tingfang, as its first president. However, as the situation in China worsened over the course of the first half of the twentieth century, Penn’s relations with that country became gradually unstable. With the communist revolution occurring in 1949, and the Chinese students at Penn in that year fearful to return home, it is no wonder that records of Penn’s relations with that country suffered in the years that immediately followed. One was able to find some China-related events that occurred at Penn in the mid-1960s. In March 1966, Dr. Derk Brode and five other Penn professors sent at statement to the United States Government “calling for [a] revision of United States policy towards Communist China.” Their hope was that if the United States could improve its relations with the People’s Republic of China, then perhaps some of the problems resulting from the situation in Vietnam, could be relieved. The next month, the Penn Museum hosted a three-day National Conference on the United Nations and China, sponsored by organizations including the International Affairs Association, the Collegiate Council for the United Nations, Penn’s Office of International Services, and the Association of International Relations Clubs. During Martin Meyerson‘s years as President of the University of Pennsylvania, from 1970 to 1980, the University’s interest in China increased dramatically. In 1972, United States President Richard Nixon visited China. It was argued that this set-off a new wave of interest in Chinese culture and the Chinese language. At the University of Pennsylvania, the number of students enrolled in Chinese language courses grew three times. The Chinese Music Ensemble of New York appeared for the first time in Philadelphia by performing at the University Museum in April 1973, which began a series of ethnic events in the Greater Delaware Valley. In 1974, the University Museum and the Chinese Students and Alumni Association showed three Chinese films, and the next year, the latter served a Chinese meal and presented Chinese folk-dancing and singing. That same year, in March 1975, sessions of “A New Look at New China,” occurred in the campus community. The series was sponsored by the University of Pennsylvania, Penn’s Forum on Social Change and the U.S. China Peoples Friendship Association, and was held in various locations including Houston Hall, the Fine Arts Auditorium, and the International House of Philadelphia. 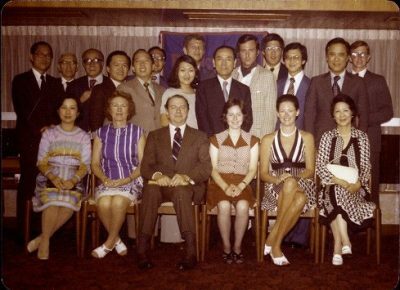 A delegation of Chinese Materials Science educators arrived at the University of Pennsylvania in January 1980 while taking a tour of the United States. This was followed by a visit on May 25, 1980, of eight Chinese scholars from Chekiang University in Hangzhou to the Penn campus. This visit was special to Dr. Chung-Tao Yang of the Penn Department of Mathematics, as he was a graduate of Chekiang and one of the members of the delegation had been a former classmate of his. Also, in August 1980, Penn began a six-week world affairs course entitled “West Meets East: A New Look at China.” More notably, though, in September 1980, an agreement was signed between Penn and Shanghai Jiao Tong University (SJTU) (pictured below), in which Penn would aid SJTU in developing its programs. SJTU would then aid Penn in calling attention to activities in China, such as those in the fields of political science and the environment, Chinese history, etc. [d]uring the Cultural Revolution, people were chastised. Now the policy of the government is very pragmatic. They need people to lead them to a modern age…. The People’s Republic of China understands that with a billion people and with the country in the archaic state it is in, they have a management problem. They are interested in the fact that Penn has a management-technology program which is one of the best in the country. [r]ight after normalization [in 1972], everyone in the country wanted to develop some kind of relationship with China… [though] [i]n most areas of technology, China is on the receiving end of us. [B]ut China has a long tradition of intellectual excellence and they are moving rapidly to catch up. In some specific areas, that will be no problem at all. For example, in 1980, Peter Zhou (pictured below) became the first Chinese student to study with the University’s Department of Materials Science. At Penn, studying for his doctorate, he had been able to receive his undergraduate and graduates degrees in China – before the Cultural Revolution. He came to study at Penn to meet with American scientists. His family remained in China.